This photograph is one of fifty-two images from Alec Soth’s 2004 book Sleeping by the Mississippi. 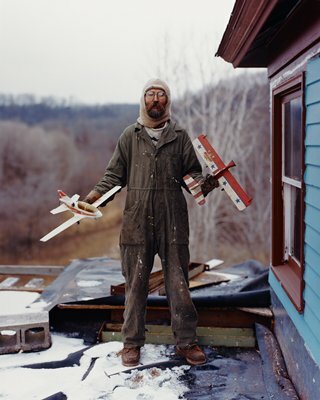 The signature picture of the series, it presents Charles, a bearded man wearing eyeglasses and coveralls, against a winter background in rural Minnesota. He holds a model plane in each hand. Soth, a Minnesota native, found Charles and all other subjects in the book while traveling along the Mississippi River on several road trips between 1999 and 2002. Using a large-format camera with eight-by-ten negatives, he took time to set up the camera and photograph the encountered strangers, producing images that appear tranquil and deliberate with impeccable details, yet also somewhat dreamlike. The series presents photography as a liberating, invigorating, and uncensored activity.